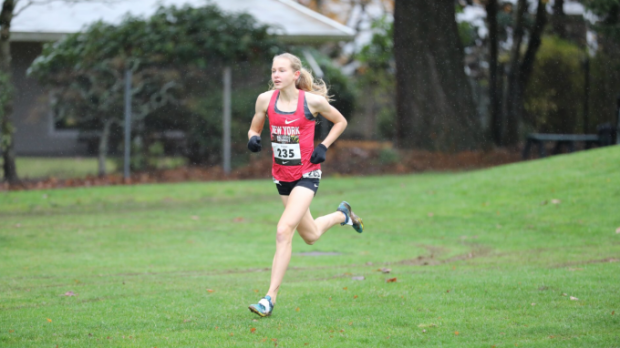 New York sophomore Katelyn Tuohy did what she's done all season at the Nike Cross Nationals -- set a hard pace from the gun and crush a new course record, today running 16:45 at Glendoveer Golf Course to break Katie Rainsberger's 2015 mark by 11 seconds. Tuohy, who improved remarkably this year after placing 49th as an 8th grader and 13th as a freshman at the championship, dropped the field early with a 5:06 opening mile. Texas sophomore London Culbreath, Illinois sophomore Katelynne Hart, and Saratoga Springs, NY junior Kelsey Chmiel were 17 seconds back in the chase pack. By two miles, Tuohy had slowed to 10:36.6 but still held a 30-second lead over Chmiel, who now ran solo in second place. As Tuohy crested the final hill, the question of whether or not she could hold on for the record was -- without a doubt -- answered in the affirmative as she crossed the line in 16:40.8. Chmiel held on for second place as California's Mariah Castillo had the race of her life for third. Only five points separated the top two girls' teams, as Fayetteville-Manlius won their 11th national title in the past 12 years with 89 points ahead of Naperville North, which scored 94 points. The Hornets had a rare true low stick in sophomore Claire Walters, who ran 17:55 for fifth overall in the championship race. She was followed by Phoebe White (15th, 18:05), Sophia Ryan (43rd, 18:39), Becca Walters (49th, 18:44), and Palmer Madsen (89th, 19:14). At the awards ceremony, FM head coach Bill Aris revealed that one of their varsity runners spent the previous night in the hospital for food poisoning and had taken multiple IVs the morning of the race. He did not name who.